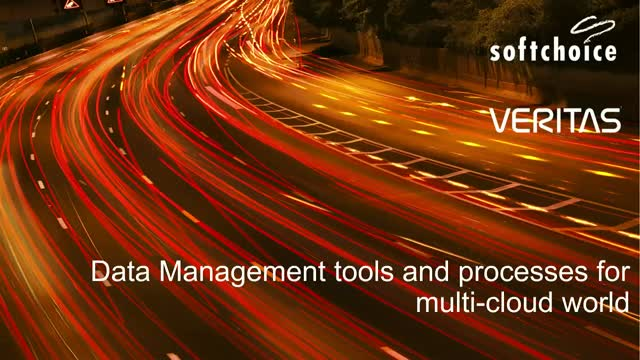 Are your Data Management Tools and Processes Scalable for a Multi-cloud World? Digital transformation is causing infrastructure to evolve faster than ever and managing data must be the top priority for any modern enterprise. Most organizations are working towards transforming their IT infrastructure and its associated capabilities, but traditional environments are being disrupted by cloud, virtualization, open source and hyper converged infrastructure. The need for holistic modern data management remains as crucial as ever to navigate this complexity and leverage information for strategic advantage. Join us on this webinar as Tony Liau, Director, Product & Solutions Marketing at Veritas Technologies and Matt Sirbu, Director of Data Management & Data Center Infrastructure at Softchoice discuss how the most important barrier to adopting hybrid IT is to have an intuitive data management solution. Attendees of this webinar will learn how you navigate through these IT obstacles to build an agile solution that extends across on-prem and off-prem architectures. Tony brings over 15 years of enterprise experience to Veritas, taking innovative data management solutions to market. In his current role as Director and Head of Product & Solutions Marketing for Data Protection and management, he leads product launch, go-to-market and global campaign strategy. Before joining Veritas, Tony held senior roles at other data protection and security companies such as Barracuda Networks, Symantec and Cisco. Matt Sirbu has spent over two decades in Information Management; focusing on Data Center Optimization, Protection, Availability and Data Intelligence solutions. Having covered most market segments across North America, he has demonstrated an ability to enter new industries, learn their unique requirements, and develop comprehensive strategic direction with exceptional results. He joined Softchoice in July of 2015, coming from Dell where he was the Director of Storage Strategy for North America. The journey to the cloud had just had a major breakthrough. With VMware software now available on the global AWS Cloud, there is now a single, consistent, pervasive connectivity and a secure platform for apps and data. Whether that is in the Datacenter or in the AWS Cloud. This gives you the power to move existing applications seamlessly to the cloud and back as needed. You’ll understand how you can quickly get workloads on the cloud without having to re-engineer your applications. Keep applying the skills you've developed on the VMware platform, backed by the large array of services in the AWS platform. This allows you to be agile, reduce capital costs and increase availability for innovations. - Immediate value Business Cases related to increased agility, disaster recovery, and stretch networking for high availability. As Practice Lead for Softchoice North America, Scott has over 25 years of Datacenter experience with EMC, VMWare and Cisco, he is responsible for defining Softchoice assessments and services offerings for VM ware and SDN. Scott works with customers to develop solid solutions as it relates to SDS, SDN, Cloud, management and automation solutions. The world’s most expansive data privacy regulation -- the General Data Protection Regulation (GDPR) -- takes effect on May 25, 2018, and organizations of all sizes must be prepared to respond. This session will provide powerful insights from recent Veritas research regarding consumer sentiment toward data privacy and the implications for accelerating your compliance journey. Additionally, we will cover a brief overview of the regulation’s most important tenants and key technology areas that can reinforce your compliance posture, including a helpful new framework for evaluating GDPR Readiness. Through our unique points of view, Softchoice challenges influential business leaders to think differently about the impact of technology on employees and customers. Title: Are your Data Management Tools and Processes Scalable for a Multi-cloud World?